kinda strange wont start the live edition with vmware..
Perhaps try the KDE version. KDE released recently, so you might get a bit more. @mether: Surely Fedora will ship with the menu icons visible. afaik, no. You have to talk to the desktop team about it. We are inherting a upstream change however. 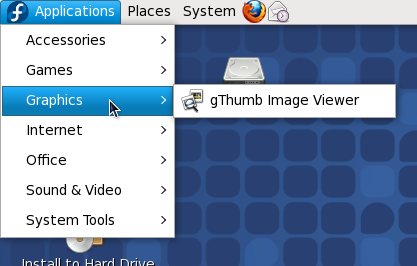 Like mether said, it is GNOME decision to remove icons from the menu like Applications and Systems. It was a letdown in my point of view. KDE does better though (I am using it on my desktop, GNOME on my laptop). Also, what's with the lack of Gimp from LiveMedia? @Luya: GIMP was taken out due to lack of space on disk. Why precisely it? Because the spin maintainers considered the application not important enough, something I am obviously in total disagreemnet with. @Nicu: I am also in disagreement with removal of Gimp. The core alone can be installed. The size of live is only 628MB which should be enough to fit extra packages. I have not checked, mclasen claimed it got over 700MB. maybe it was about the 64 bit version of the spin? Any ideea when he show will be on? @tomitzel: not yet... is not even filmed. Will post a follow up.